Lock in a great price for Las Cotingas Lodge – rated 8.3 by recent guests! This was a beautiful hotel with amazing views and extremely convenient to the beach although be warned, to get such an amazing view, one must climb many stairs! The room was great so it was worth it but the bed could’ve been slightly more comfortable – there was no mattress topper or anything like that so the sheet tended to slide around during normal sleep movement and it definitely impacted the ability to get a really solid good night of rest! The views of Drake Bay from our room and the common room were outstanding. We were on the upper floor of one of the ocean view rooms and it felt like we were staying in a tree house. One afternoon we had scarlet macaws hanging out in the tree right next to us. Most importantly, the staff is amazing. Unfortunately on our first full day in Drake Bay, my friend took a tumble on the main road going down to the beach and banged up her knee pretty badly. Someone nearby was kind enough to call the hotel for us and just a couple minutes later they showed up with a water and their car to take my friend to the local clinic. The clinic wasn’t open yet, so he had even called to get the doctor to come in early. Our Spanish is basically nonexistent, and he was kind enough to stay with my friend at the clinic and translate while the doctor cleaned and stitched up her knee. The help and kindness was very much appreciated. The place was exactly what I expected and even more. The views were great from the deck and sitting area. the AC worked great, which was life-saving. Nice short walk to the beach and town areas. Breakfast was good, but you can get great nearby breakfast for a similar price. The views from the property were outstanding! We stayed in a front row sea view cabin and spent most of our time on the porch in a rocking chair or hammock observing the scenery including lots of birds. The family who runs the place is very nice. The breakfast was hearty and delicious with fresh fruit, eggs, pancakes, and juice. Our room also had A/C which was welcome in the humidity of the area. I highly recommend spending the extra money for the full sea view cabins. Great breakfast, full plate of fruit, juice and options for eggs, pancakes etc. Odir and his family were very accommodating! Breakfast was prepared each morning before our tours and it was amazing! Odir arranged our tours for us and we couldn’t have been happier! This was a true Costa Rican experience! We were upgraded to an ocean view and loved sitting on our deck. Monkeys and birds visited often! We enjoyed meeting people from other countries in the Open air lounge or around the breakfast tables. Oder was very helpful with tours and restaurant reservations. We miss it already! We loved the room and view, we stayed in the ocean view and it was amazing! Other reviewers aren't lying about those stairs, but so totally worth it! Tons of humming birds and butterflies and flowers! The location is amazing; the climb is well worth it, for the plethora of trees that attract gorgeous birds, and the amazing view from the deck that serves as the restaurant and lounge. A/C was welcome as it does get hot in Drake Bay. Staff helped carry our luggage up the stairs and then gave us free smoothies upon arrival! Las Cotingas Lodge This rating is a reflection of how the property compares to the industry standard when it comes to price, facilities and services available. It's based on a self-evaluation by the property. Use this rating to help choose your stay! 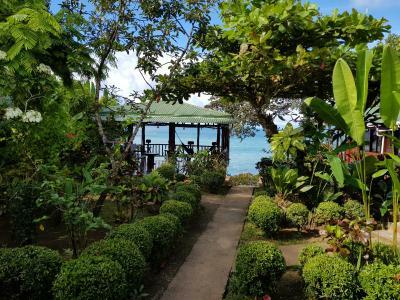 One of our top picks in Drake.Offering an extensive green area, a furnished terrace with hammocks and wooden décor, Mirador Las Cotingas Lodge is set on the hills at Drake Bay and 2,650 feet from the town center. The bungalows offer a private bathroom, a fan, wooden furniture and a mini-fridge. All bungalows also feature ocean and garden views and free Wi-Fi is available in public areas. The on-site restaurant serves international food and offers stunning views of the ocean. Guests can find as well a variety of restaurants and shops within 1,650 feet. Tours to Corcovado National Park and to Isla del Caño island where you can do snorkeling, diving, bird watching, dolphin watching and whale watching, can be arranged. This lodge is a 15-minute drive from Drake Bay Airport and a 1-hour boat ride from Sierpe of Osa. Puerto Jiménez Airport is a 1-hour drive away and Puntarenas town is 24 mi away. When would you like to stay at Las Cotingas Lodge? This small wooden bungalow offers a private bathroom, a fan and a fridge. It features views of the garden or patio. Please note that the rate is based on 2 guests. Maximum occupancy is 3 guests (see Hotel Policies). Please inform the property of the number of guests so that the correct number of beds can be prepared. If you do not let the property know, a 3rd bed cannot be guaranteed. This wooden bungalow offers a private bathroom, a fan and a fridge. It features partial views of the sea. Please note that the rate is based on 2 guests. Maximum occupancy is up to 4 guests, available only by contacting the property directly. This spacious double room features wooden décor, a mini-bar and a private deck with partial ocean views. Please note that the rate is based on 2 guests. Maximum occupancy is up to 5 guests (see Hotel Policies). House Rules Las Cotingas Lodge takes special requests – add in the next step! All children under 2 years are charged USD 2 per night in a crib. Las Cotingas Lodge accepts these cards and reserves the right to temporarily hold an amount prior to arrival. Property kindly asks to guests to bring and cash since the nearest ATM is about 1 hour's drive away. Property also requests to bring your own flash lights. Softer bed or a mattress topper to lessen the impact of the sheet sliding against the nylon. The shower pressure was variable. There are a lot of stairs to get up there from the beach. It was hard after a day of scuba. I would not book a tour with this place again - we were not booked with the company we asked for and the price-value of the “tour” we got was extremely poor. The location was great. Loved the little bungalows and relaxed atmosphere. Very peaceful. Common area hammocks with gorgeous views are what makes this place worth the stay. We were charged an extra 13% for using the credit card. (We were told it would be 6%) This was in addition to the 13% tax. Location was great, very near the Sierpe ferry arrival point. Nice relaxing deck overlooking the bay with pretty gardens. Very helpful and pleasant staff. I had jammed the lock on my suitcase and was helped to break into it with a fine jewelry saw! The staff were completely useless. I contacted them several times before arriving to understand the logistics of arriving by boat (timing? Cost? if anyone would meet us on arrival?) but they never responded to any of my emails. I ended up having to call them the night before, which caused a lot of stress. Also they charged me $200 when I booked a month before arriving and claimed this would just be temporary and for the purpose of reserving the room and would be reversed. However they then never unfroze this amount and charged me the full cost of the room when I left... effectively overcharging me by $200. I had to contact them afterwards and they returned the money to me by PayPal but didn’t bother to reimburse me for the charges or what I lost on the exchange rate. All in all, completely shoddy and sub-par business practice. I don’t think I will be recommending this place to anyone. The location was great - just a few steps away from the main beach. The little bungalows are nice and the balcony had a great view of the ocean. Onlt suggestion would be mosquitonets. But I dont think other hotels have it either. Very nice place. The view is really magnificient. The rooms are basic but really nice and have all you need. Own toilet, a/c, fan etc. Mosquitos is not a big problem at all but got a few bites during the night. There are no mosquitonets in the room. The stairs up to the hotel is no problem. About 70 steps and the stairs start just 50 meters from the beach. We saw scarlet macaws and toucans in the really nice garden they have. They serve nice breakfast, just order it the day before. Very friendly and helpful staff. Most of the rooms have balcony with fantastic view - go for one of these. All in all we were very excited about the place. Would definately recommend this and we would stay here again. The room we were in needed some maintanence. The tiles going into the bathroom were broken and could trip someone. However, our friends had a wonderful cabin. The manager is very accomadating and friendly. The view from the property is fabulous. It is a steep climb up from either the parking lot (ramp) or street (steps). I have mobility problems and the manager graciously moved us to a sister property on the beach. The rooms themselves could use a little tender, loving care as there are some minor faults such as cracked floor tiles in the bathroom which are falling apart and the balcony door didn't close properly. In our opinion it was a little expensive for what it is although you are paying for the view. The view from both the room balconies and the chill out area is amazing and provides the perfect place to watch the sunset with a drink in hand. The garden is well looked after an attracts some cool birds. Very comfortable bed! Of all the places we stayed in Costa Rica, this one seemed the most laid back which meant things were sometimes disorganized, so I would recommend double-checking on airport shuttles and tours to make sure things are booked before and during your stay. Lots of steps up and down.